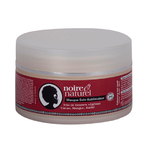 The natural Noire Ô Naturel Detangling Hair Mask is rich in precious and rare vegetal oils (argan, jojoba, rosewood…) renowned for their virtues (restoring, nourishing, softening). Three natural vegetal butters (cocoa, shea butter and mango) combined with smooth ylang-ylang, rosemary and sandalwood essential oils, provide a creamy texture and a natural, subtle color. 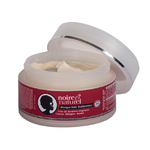 The mask can also be applied directly on dry hair, like a cream, as a nourishing leave-on daily haircare. 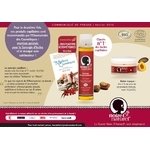 You can also mix a small quantity of this product with the Hair Oil Synergies, in order to help seal in the moisture. Be careful not to overdose. 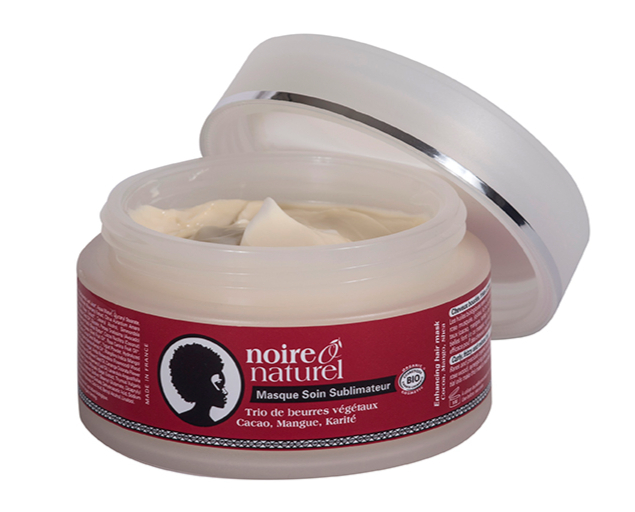 Apply thoroughly along the length of the hair, so that the product can completely penetrate! INCI: Aloe Barbados’s Leaf Juice*, Aqua (Water), Glyceryl Stearate, Rosmarinus Officinalis (Rosemary) Extract, Citrus Aurantium Amara (Bitter Orange) Flower Extract*, Cetearyl Alcohol, Simmondsia Chinensis (Jojoba) Seed Oil*, Glycerine, Persea Gratissima (Avocado) Oil*, Butyrospermum Parkii (Shea) Butter*, Cocos Nucifera (Coconut) Oil*, Inulin, Olea Europaea (Olive) Fruit Oil*, Rosa Canina Fruit Oil*, Theobroma Cacao (Cocoa) Seed Butter*, Yogurt Powder, Hydrolyzed Wheat Protein, Argania Spinosa Kernel Oil*, Mangifera Indica (Mango) Seed Butter, Acetum (Vinegar), Aniba Rosaeodora (Rosewood) Wood Oil, Helianthus Annuus (Sunflower) Seed Oil, Cananga Odorata Flower Oil, Rosmarinus Officinalis (Rosemary) Leaf Oil, Lavandula Angustifolia (Lavender) Extract, Salvia Officinalis (Sage) Extract, Thymus Vulgaris (Thyme) Extract, Tocopherol, Sodium Stearoyl Glutamate, Dicaprylyl Ether, Lauryl Alcohol, Potassium Sorbate, Dehydroacetic Acid, Sodium Benzoate, Sodium Hydroxide, Citric Acid, Benzyl Alcohol, Linalool. Percentage of natural ingredients: 98%. Percentage of organic ingredients: 72%. Without SLS, ALS, paraben, silicone or GMO, without artificial fragrances or color. Certification: ECOCERT Greenlife certified ecological and organic cosmetic, according to the ECOCERT standard, available here: http://cosmetiques.ecocert.com. Apply the mask generously on washed and towel-dried hair. Massage gently with your fingertips. Leave the product on for at least 30 minutes or several hours under a warm and damp towel, for a more intense care. Rinse. Avoid eye contact.